In February 2015 we published a story that highlighted the difference between breast computed tomography (BCT) that generates true 3D images, and the widespread digital breast tomosynthesis (DBT) systems that produce quasi-3D images. Koning had just received FDA approval for its BCT scanner to be used as a diagnostic device, meaning that it could only be employed as an adjunct to full-field digital mammography (FFDM) or DBT, but not for screening purposes. Researchers from Erlangen in Germany have just published a paper in European Radiology that describes the technical feasibility of a new BCT system. In their introduction, Kalender and his colleagues stated “All efforts shown so far have been criticized and partly disapproved because of their limited spatial resolution and higher patient dose when compared to mammography.” Of course, this statement is not strictly true because Koning received both FDA approval and the CE Mark on the strength of a paper published in the American Journal of Roentgenology in 2010. 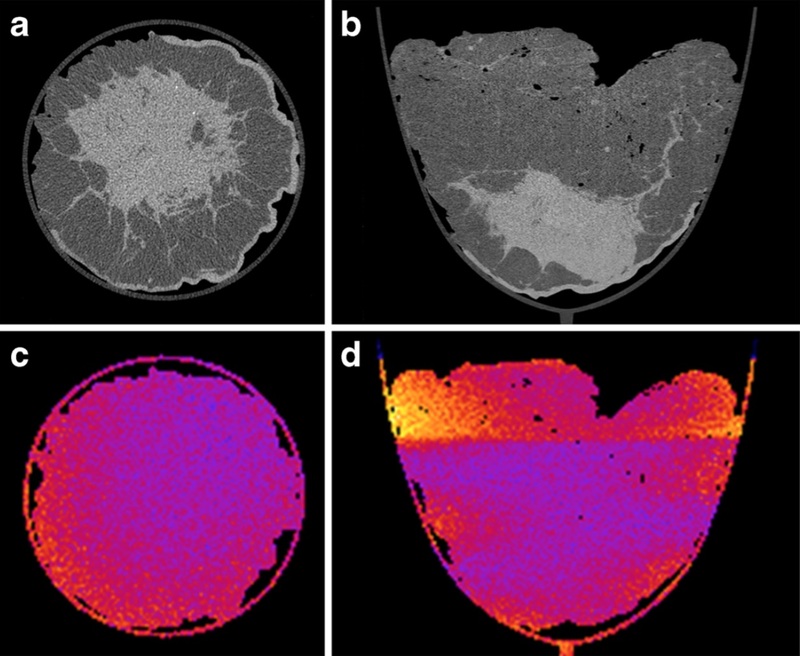 Nevertheless, the Germans set out to develop a BCT system with improved spatial resolution and average glandular dose levels comparable to mammography. Built by CT Imaging their system is similar to Koning’s BCT scanner, where the woman lies in a prone position with her breast suspended through an opening in the examination table (see above right, © European Radiology). The key to their new cone-beam BCT design is a photon-counting detector manufactured by Swedish firm XCounter. So, what is the likelihood that photon-counting BCT will replace the now ubiquitous DBT systems that are proving to be increasingly popular for breast cancer screening? First, there will be the challenge of imaging the axillary region where the lymph nodes are located (note the woman above is young and agile), and second, companies like Koning and CT Imaging will have to find a way to manufacture systems that are competitively priced. As you recall it was I who introduced you two in the hopes that you could produce a single unit combining D.B.T. with ultrasound. I have been relentless in my attempts to secure the $250,000 necessary to achieve the making of what I consider to be an amazing breakthrough in mammography. I have approached people from all walks of life, billionaires, millionaires, Hollywood film stars, United States Senators and some very ordinary men and women who have lost loved ones to breast cancer. Hologic has an iron-clad fist on the DBT market, and probably does not want competition. The rationality: The DBT (3D) mammography unit exists, as does Ultrasound. The fact that a radiologist has to stand on his/her head, making it extremely difficult to read two comparison films, is neither here nor there. The fact that women must wait an unnecessary length of time to get their results is neither here nor there. The fact that the cost of having two consecutive tests is more expensive is neither here nor there! Regrettably and tragically for womenkind, they are the ultimate losers. I should have known that big-money would be the ultimate winner. The Walrus said “It is time for me to say goodbye”, I really did give it my best shot!